We would like to thank you for your support with your investment in Good Energy Bond. With your investment we are delivering on our development strategy. Good Energy Bonds I have supported the development of 13 solar farms across the UK and over 150MW of renewable projects. 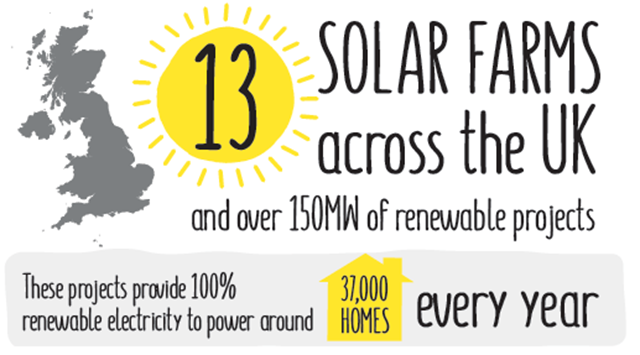 In addition to supplying green electricity to UK households these solar farms have made a significant positive impact on the lives of local communities through community benefit funds, educational open days at our sites and wildlife and biodiversity programmes. Following government policy changes over the last eighteen months, we are now stepping away from the development of energy generation assets as the market has moved in favour of large scale developers. As the energy market continues to evolve at a rapid rate we are now focusing on growing our core supply business and developing sustainable energy solutions in areas such as storage, electric vehicle networks and green business consultancy to support consumer and business needs in this new environment. Good Energy Bonds II was launched to support this new strategy and we were overwhelmed by the support and vote of confidence from our customers and investors. Good Energy repaid all Good Energy Bonds I bondholders who did not choose to continue with the Bond, on 29 March 2018. Our new strategy will ensure we continue to power the choice for a greener and cleaner future together and deliver our long-term ambition to help realise a more sustainable energy market for the UK. Unless you notify Good Energy that you wish to redeem your Good Energy Bond, the Repayment Date will be extended annually. Good Energy can elect to repay the Bonds in full at any time. Bondholders can redeem their Bond on the Repayment Date by providing at least six months’ notice before the Repayment Date. Customer bonus interest will continue to accrue at 0.25% per annum for each Bond year that you are a customer on 1 January, up to and including the Bond year in which Good Energy Bonds I is repaid or redeemed. The final payment will include the amount of the original investment plus any accrued but unpaid interest at that time. Further information on the terms of repayment, redemption and interest payments can be found by visiting www.goodenergy.co.uk/about-us/our-bonds/bond-disclaimer/ and downloading the Good Energy Bonds Invitation Document. Thank you for enabling us to power a cleaner, greener future together. Interested in becoming a Good Energy bondholder? Go to Computershare to jump straight into your investment. View our latest annual and interim reports.